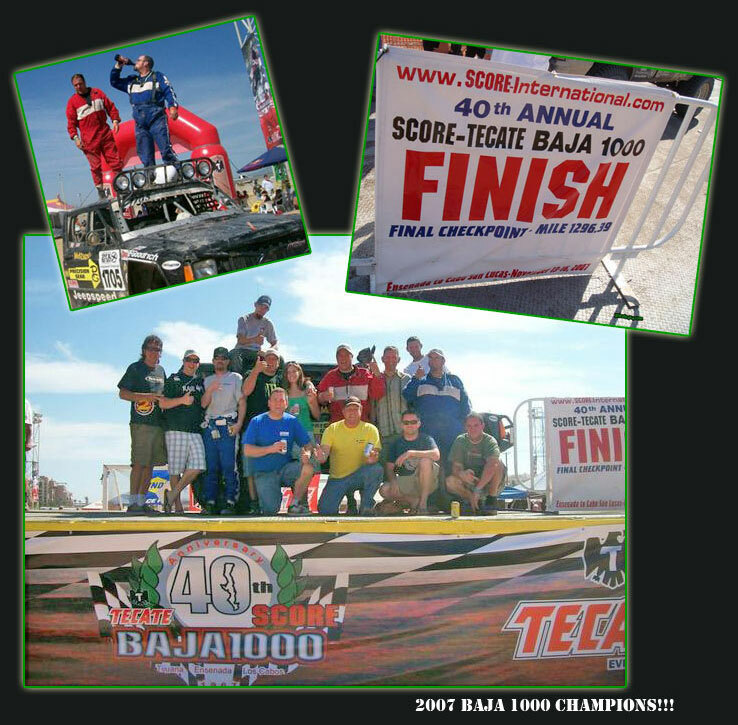 2007 Baja 1000 - If It Was Easy, Everyone Would Do It! This year Team Pirate went back to Baja with high hopes of defending last years Class 17 win. But this year the plan was to step it up a notch. Not only did we plan on racing in Class 17, but Lance was also racing in the #2 Trophy Truck with "Pistol" Pete Sohren. With this year being the 40th anniversary, SCORE also stepped up the challenge and made the race from Ensenada to Cabo San Lucas, totaling 1,296 miles. 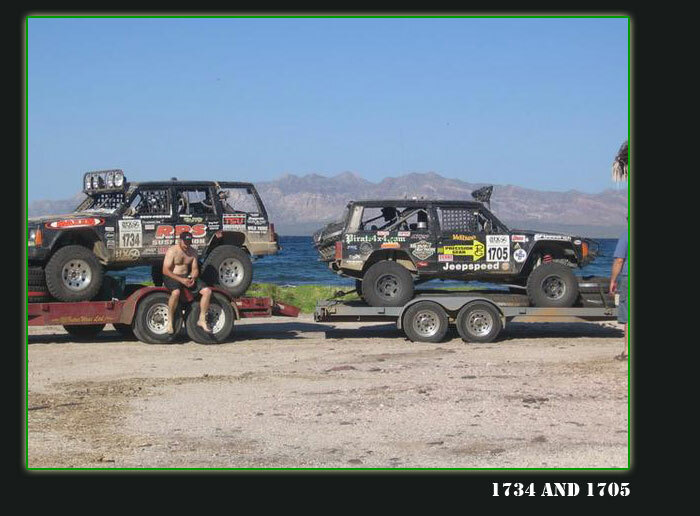 Last year was our first race ever in Baja. Three weeks before the race Lance, Camo, and myself came up with this hair-brained idea, of racing the 1000. Team Pirate bought a Jeep, Shaffers Offroad prepped it, and we were sitting at the starting line three weeks later – with a team of rock-crawlers that had never been there before. We were lucky enough that everything went our way and we won our class. The big question was, could there be a chance of a repeat? We would find out, come Tuesday November 13, 2007! 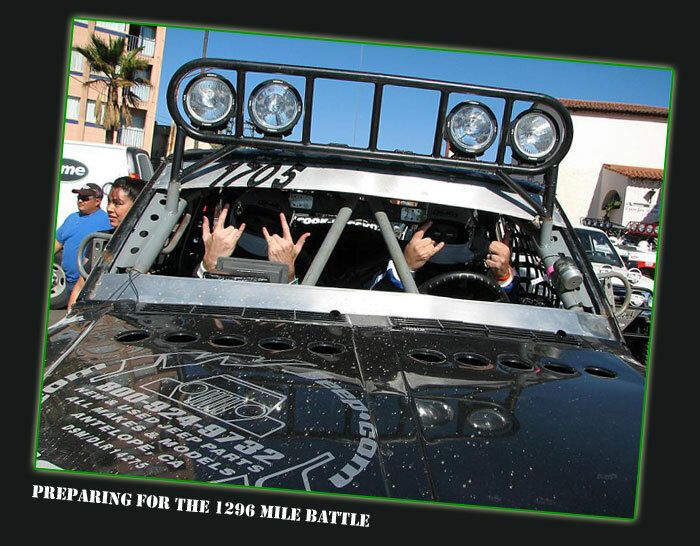 At around 10:30am the first four wheeled vehicle, Trophy Truck #38, Garron Cadiente, left the line and put the wheels in motion for the 40th anniversary of the Baja 1000. Lance was navigating in Pistol Pete’s Shampa/Precision Gear/Maxis #2 Trophy Truck. Pete’s truck is unique in the TT class because it is the only 3-seater truck, with the driver in the center. Jason Scherer, W.E. Rock Super Mod rock crawler, was the co-driver in the third seat. They were scheduled to be the 16th truck off the line. About three miles into the race, they lost a radiator hose. Luckily they were able to get the hose fixed and bummed some water from the local spectators. Lance was uncertain exactly how many miles he and Jason would be co-riding before the race started. Jason ended up riding until about mile 700 and Lance was a trooper and navigated all but 200 miles of the race! Ron Stobaugh of Precision Gear teamed up with Pete to drive during the night since Pete haspoor night vision due to being blind in one eye. Ron would also be driving a Class 8 for the last leg of the race. The race was going exceptionally well for the #2 TT. They were mixin’ it up with Robby Gordon for the most of the race. They did make an unplanned stop at one of the Viladosola #4 TT pits -to borrow a spare tire and some engine oil. Approximately 150 miles or so before the finish they started to experience rear differential problems. Pete backed down the pace and limped it into the finish line, for a 4th place victory – right behind Robby Gordon. This was a colossal accomplishment for Pete and his team because they only used 2 chase trucks for the entire race. The logistics that go into a TT team is insane!! Let alone when you are trying to chase a team with only 2 trucks. Both of the chase trucks were towing trailers. One of which, was towing a back up TT. When you are chasing a truck that is capable of running at speeds upwards of 130mph, and the chase truck is only able to safely do 70mph, planning has to be perfect! Pete and his crew, time and time again, challenge the odds by taking a knife to a gun fight – and come out on top!!! At around 12:30pm #1705 Precision Gear Jeep Speed left the starting line with myself behind the wheel and Dave Schneider in the co-dog seat. Our strategy was simple; get the lead in our class as fast as possible, and try to maintain it. Within only 5 miles of the race, we were in the lead. Everything was going well and we were making great time passing a lot of cars from other classes. At RM85 we hit a booby trap which was a trench dug in the road by the locals. This is their way of adding excitement to the adventure! They also enjoy throwing full cans of beer, hot coals, and other things as you race by. Unfortunately for us, the result of hitting the booby trap was a broken steering box. To make matters worse, the nearest steering box was in a chase truck over 100 miles from us at another pit. We sent "Chase JK" (the Shaffer's Offroad project Jeep JK) after the replacement steering box. After 4 hours of sitting and waiting I started to feel pretty bummed out. I made a phone call to our teammate Camo, to inform him of our situation. Camo reminded me that the race had just begun, and to cheer up. He also shared with me that if he were in my shoes, he'd go out behind a cactus and "rub one off" because it would add to what a great story it would be to tell afterwards. That definitely got me laughing! Just think, when the going gets tough Camo finds himself looking for a cactus! After 5 hours of down time, Chase JK finally appeared out of the dark Mexican desert. 15 short minutes later, and Jeremy and Dan had us all fixed. Now it was all about making up lost time. I drove the poor Jeep to its limit, and maybe a little beyond that to try and make it to Checkpoint 2. The tension was high as we approached Checkpoint 2 with only 8 minutes to spare! It was now time to hand the vehicle over to Jeff and Matt. They continued to make up time on each Checkpoint. By this point there was only 1 other car still running in our class - #1734 Bob Roggy and Cliff Cook. They had experienced their own share of problems, but they were still way out in the lead. 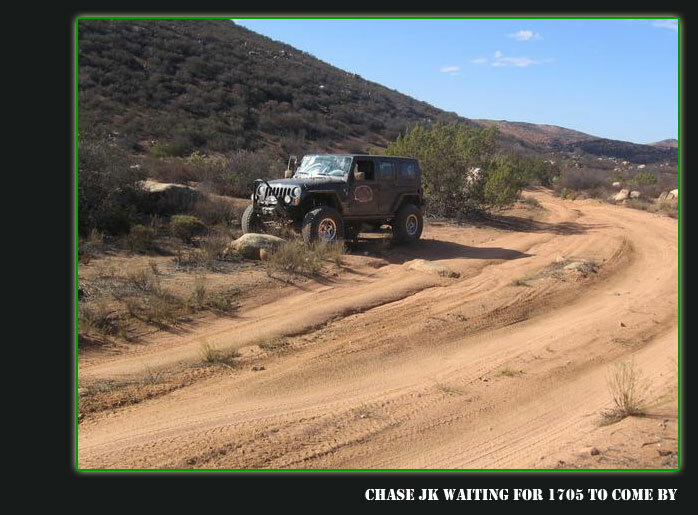 At BFG Pit 6 Jeff jumped out and Camo took the wheel of the #1705 Jeep Speed. Let me tell you, this was like turning a pit bull loose on a miniature poodle! We were approximately 120 miles behind #1734 and he swiftly made up 60 miles on them. The original plan was for Lance and Jason to get in the car and drive the last 300 miles. Unfortunately they were just too worn out from the time spent in the #2 Trophy Truck, so at RM1,100 Jeremy and I got into the truck to bring it to the finish. Roughly 50-60 miles after we got in, we caught and passed 1734! Unfortunately for them they were suffering mechanical issues and were going to try to limp to the finish. We ended up having to make an emergency stop at a BFG pit with radiator problems. We frantically fixed the radiator, and Camo decided to jump in the co-dog seat for the last 150 miles. We over-analyzed every creak and rattle the Jeep was making in that last 150 miles, just waiting for something to go wrong. After 2 days of non-stop racing, we were completely wore out. It seemed like an eternity ago when we crossed the starting line. Both of us instantly felt energized when we heard a familiar voice on the radio. It was Lance in one of the chase trucks, and he informed us that Pistol Pete was behind us. It was a great feeling to know that Pete would be chasing us all the way to the finish in his Trophy Truck pre runner. When we crested the hill overlooking Cabo San Lucas, the feeling was surreal. All the hard work that the chase crews, drivers, and companies that helped us out had paid off! We sat there both silently, holding back tears of joy as we made to the finish line where our entire team roared with excitement, and greeted us with a couple of bottles of "champagne" (ok, they were 40 ouncers of Tecate, but who's counting?) Sure, we had mechanical issues, and unfortunately they were all while I was in the truck! But we had done it, we won class 17 two years in a row! After being up for 3 days, we were all dog-tired. But this was not the time to whimp out and go to bed! Team #2 and #1705 headed out on the town to celebrate our accomplishments with a few well deserved cocktails. Also worth mentioning, was Jesse James of Monster Garage. Jesse was the 22nd TT off the line. He experienced quite a few mechanical issues, but that didn't stop him. Not only did he finish, but he drove the entire 1,296 miles to finish of 15th place iron man style, with a time of 38 hours 18 minutes. Now that is a serious stud! To finish or win in Baja – things truly must go your way. It takes tons of teamwork and logistics must be precise. Baja truly is the land that time forgot, and you never know what waits for you around the next corner.